CHICAGO (WLS) -- A new park trail that overlooks Northerly Island will open to the public on Friday. The Interior Park Trail, a 43-acre project that has transformed nearly half of the island, and restores the space to look much like it did before the city was developed. The restored land once occupied by Meigs Field, the commuter airport destroyed in a 2003 midnight raid ordered by then-Mayor Richard M. Daley. The Army Corps of Engineers dug a pond in the island's middle and used the excavated earth to build hills. The restoration's price tag to date is $9.5 million, about two-thirds of it federal money. 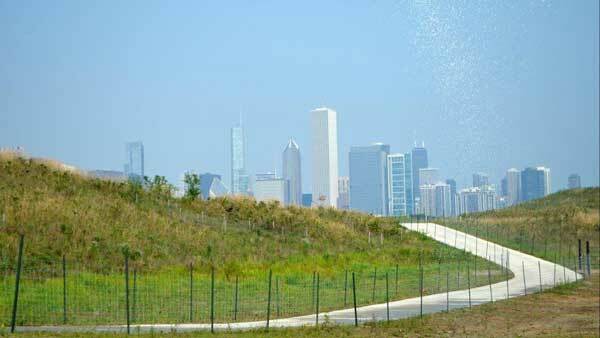 The Interior Park Trail on Northerly Island opens Friday.